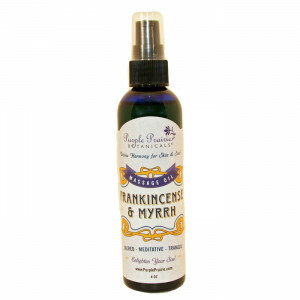 Enlighten your soul with a divine journey and tap into your spiritual bliss with the sacred gifts of Frankincense & Myrrh. In addition to the emotional and meditative benefits, these oils offer numerous benefits to problem skin. 4 oz. PET bottle with pump top. Directions: Use anytime for massage, in bath water, or after shower for soothed, nourished skin. WARNING: May awaken the spirit. 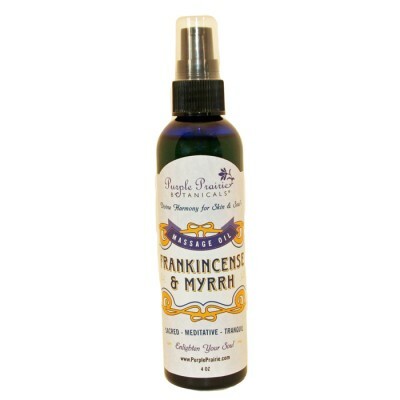 100% Natural Ingredients: Organic olea europaea (olive) fruit oil, organic helianthus annuus (sunflower), boswellia carteri (frankincense) oil, commiphora myrrha (myrrh) oil, amyris balsamifera (amyris sandalwood) oil, citrus aurantium dulcis (orange) peel oil, boas de rose (rosewood) oil and tocopherol (vitamin E).